One of my weekend protocols is to prepare and store the idly/dosa batter for rest of the next week. I’m sure it is the case with many of the working women and the dosa batter is a saviour when you are already battered at work! But monotony is boring, hence I prepare the batter for millet dosa or adai or aapam in addition to the plain dosa batter. This helps in some variety. Here, I’m sharing you the method of making kambu dosai. Soak all the ingredients (except salt) together in water for 2 hours. Drain the water and grind using a mixie or wet grinder to the consistency of idli batter. Once done, transfer to a bowl and add required salt. Leave to ferment overnight (or follow your usual ways of fermentation). Now the batter is ready. You can add chopped onions, coriander leaves after tempering with some mustard seeds and urad dhal. This is optional. Heat a tawa and pour a ladle of the batter and spread it in a circle. Sprinkle some oil to it cook. Flap the dosa and cook the other side. Serve hot with some chutney of your choice (think tomato chutney with some extra red chillies and a little tamarind). Check for dust or small stones in the millet before soaking. Don’t add more cumin than mentioned, as it gives a slightly bitter taste when ground together with kambu (lesson learnt on own). Soaking and grinding the dry chillies and curry leaves together give a really nice flavour to the batter. 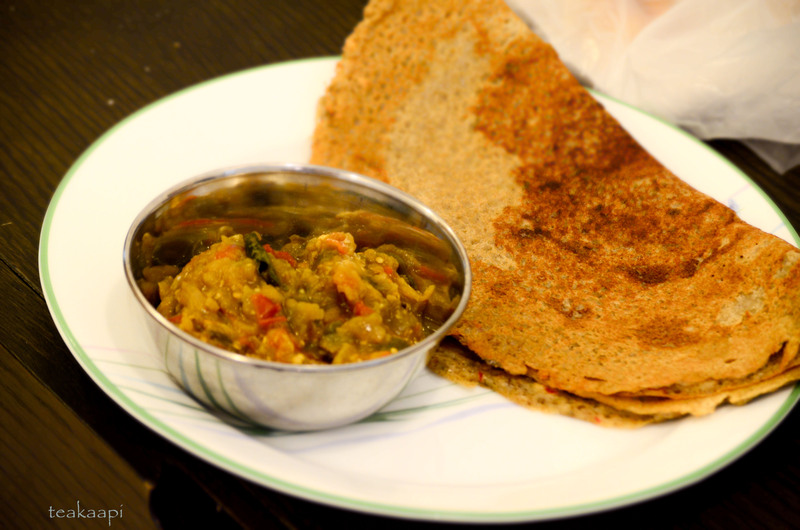 Generally millet dosas need an extra minute to get cooked when compared to the plain dosas, hence maintain a medium flame while making dosa and cook on both sides. Millets are easy to cook and a number of tasty dishes can be made out of them. Have you checked my Varagu Pongal yet? You can find it here. Do try the kambu dosa and let me know how you like it in the comments below.